Kind of silly, huh? But that’s how my brain works. Instant Worst Case Scenario. As the officer approached my Mom Mobile (read: minivan), I got a huge lump in my throat and rolled down the window. My wallet was sitting right next to me in the console. My proof of insurance is in the mobile app for my bank. Registration is up to date. BREATHE. “Ma’am, I’d like to see that bottle.” OH CRAP. My drink. It didn’t even dawn on me. My drink of choice that day? 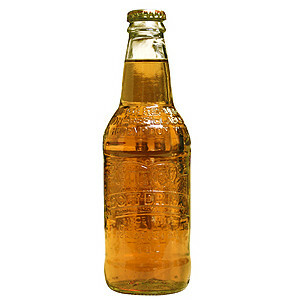 The officer had seen me taking a swig of my delicious cream soda as I drove down the road. I quickly handed him the bottle and he looked at it, sniffed it and then laughed. And I laughed. We both laughed. I quipped, “The funny thing is that I don’t even like beer!” He apologized for taking up my time and told me to have a good day. He walked back to his cruiser and then that’s when it happened. Why? Because I have a fun little phobia called dikephobia. No, it’s not a fear of lesbians. I know the exact moment that this phobia entered my life. When I was a young girl, my father used metal nail files. He kept one on his dresser at all times. SisterFriend and I would use them, but we were really bad about putting them back. Of course, it was irritating. So we were forbidden to use them, unless we put them back. For THREE HOURS, I held firm. I never doubted my innocence. Eventually, they gave up. I think I was sent to my room to “think about what I’d done”. I cried. A lot. Flash forward several years. This whole situation came up while my family was reminiscing about our childhood years. SisterFriend says, “Man, I felt SO BAD when that was happening.” I asked why she would feel bad and she said, “Well, I had the nail file.” WHAT?! She sat in her room and said NOTHING for three hours! Can you believe that? So, of course, I have to give her a hard time about this every time something like this happens. But the phobia is real. And it’s not fun. My worst nightmare is getting arrested for a crime I did not commit or even worse – getting convicted! If a police officer pulls into traffic behind me, I stop breathing for a short time. Panic attacks are not uncommon. (That ticket I mentioned earlier? I had to call a friend to talk to me on the phone for the last two hours of my drive to keep me from freaking out.) Fun times, fun times. So, lesson learned. IBC Cream Soda will not be consumed in the car, unless it’s in a can! Do you have any phobias you’re not embarrassed to admit? Help me feel a little less crazy and let me know in the comments. Bonus points for any funny stories involving them! « The Devil (Media) Made Me Do It?